jpoc's Cheese of the week! This weeks cheese of the week is Blue Stilton. Actually, last weeks cheese of the week was also Blue Stilton and next week, guess what? 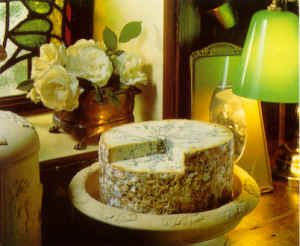 The cheese of the week will be Blue Stilton all over again! I don't have a problem with that. Do you? Anyway, look at the yummy, mouthwatering picture below and, if your browser is equipped with the latest scratch'n'sniff plug-in*, you can scratch the image with your mouse (just hold down the left button and scratch the pointer across the cheese) and you will find the room filled with the smell of the king of all cheeses! Mmmmmm, I can smell it now. *Not available for LCD displays.